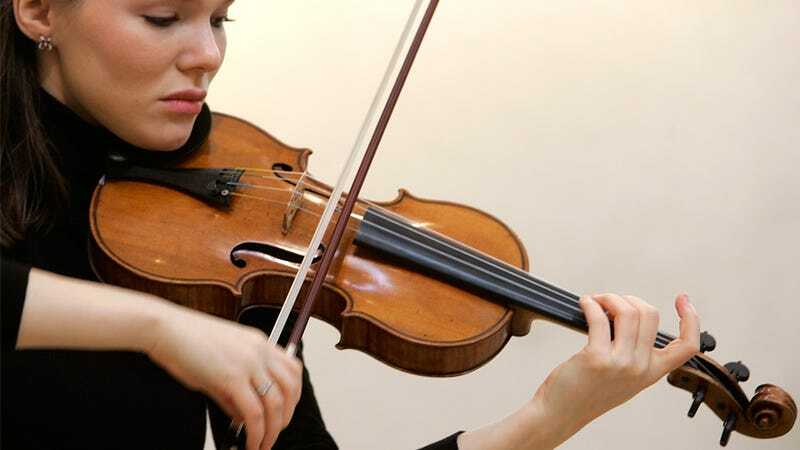 Because the few remaining instruments can fetch millions of dollars at auction, scientists have been trying to pinpoint exact what makes a Stradivarius sound so phenomenal so they can be recreated. It's partly due to a rare type of wood used by Antonio Stradivari that a Swiss wood researcher has managed to artificially recreate using a couple of species of fungus. Working in the late 17th and early 18th centuries Stradivari had access to a special type of wood that grew between 1645 and 1715 when temperatures stayed on the cool side all year round. During those years, the trees grew very slowly resulting in a particularly dense wood with high elastic properties. Finding wood with similar properties is downright impossible these days, but Professor Francis W. M. R. Schwarze, a wood researcher at the Swiss Federal Laboratories for Materials Science and Technology, has found a way to artificially recreate it. It turns out that two species of fungi—Physisporinus Vitreus and Xylaria Longipes—can decay Norway spruce and sycamore trees in such a way that increases the wood's density while retaining its ability to resonate, vastly improving its tonal quality. Lumber that's been treated with the fungi is known as mycowood, and working with modern violin makers Martin Schleske and Michael Rhonheimer, Schwarze created a violin with the material and pitted it against a Stradivarius from 1711. Surprisingly, in a blind test a panel of experts was unable to distinguish the fake Stradivarius from the real thing.